Where the World goes for Signs!!! We are here to help. Call us for any of your sign needs! Friendly sales, no-obligation quotes, along with fast and quality production. You can't get any better! I just love our new signs. They really make a difference and will be so helpful for all who come to our park. Thanks to you and your crew for getting this done before the season opener. Contrary to popular belief, graphic design is not all about artistic skill. A variety of external factors, including everything from personal taste to raw talent, play a big role in how your design will turn out. Recognizing the importance of these outside influences on the success of the design process, we set out to develop a web site chock full of tools that would allow our customers to confidently create their own designs. While anyone can dabble in the craft, some people are just better at it than others. If you're one of those less fortunate, not-so-artistic types, not to worry. 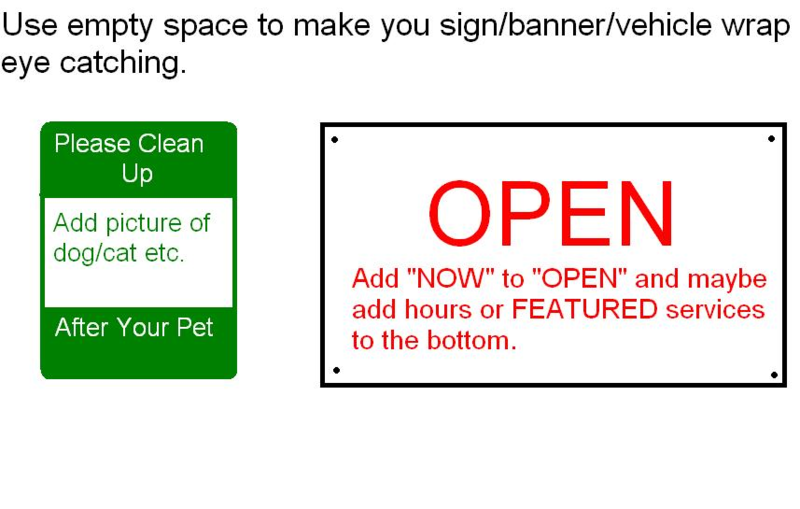 By following the guidelines we've set forth below, you should have no trouble designing a respectable sign, banner or vehicle layout, no matter your pre-existing artistic ability. Choose colors that will not blend together and opt for combinations that are easy on the eyes. While red on black is not a very readable choice, if that is what you want, fine. 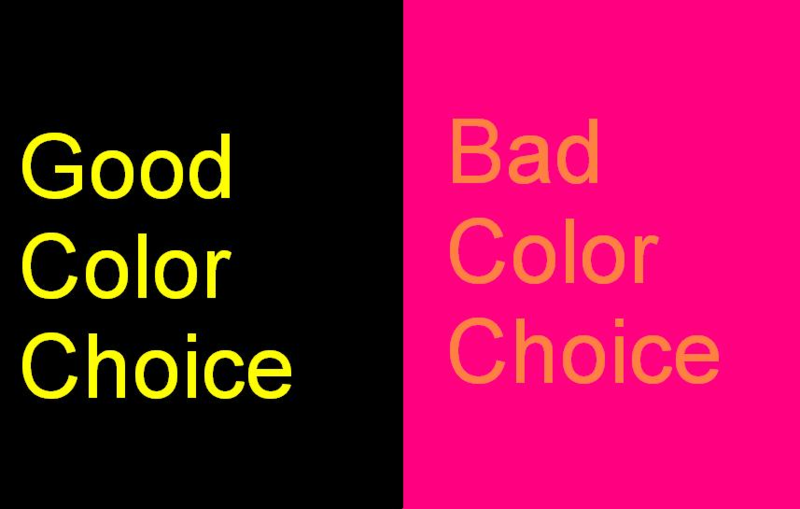 Keep in mind, however, that by choosing tone-on-tone variations you are sacrificing readability. If your potential customers can't easily read your sign, chances are they'll ignore it. Over the long haul, that can result in a significant loss of business. In most cases, the farther away you can read your advertisement the better. Some good color selections are yellow with black, yellow with green, white with any dark color (i.e. blue with white, red with white, etc.). The key is to choose colors that sharply contrast each other so as to leap off the design. If you're still set on using dark combinations, like red on black, consider outlining the edge of your letters in white. This technique allows for separation between the colors and will attract your audience's eye much better. 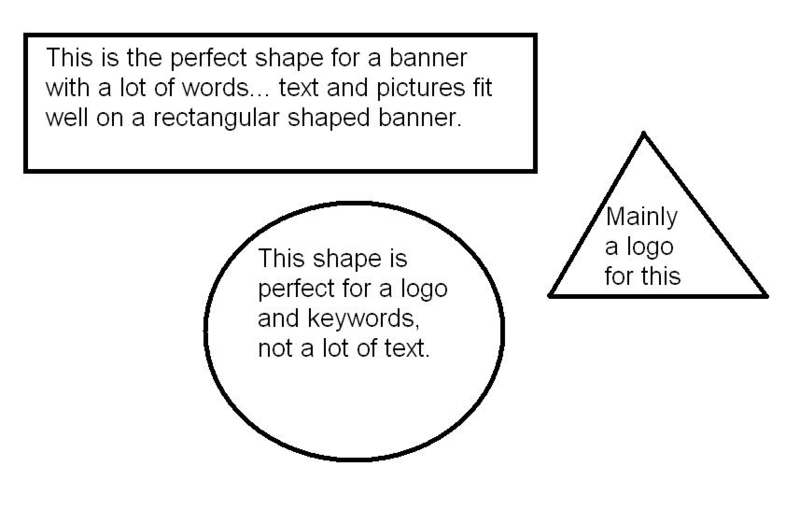 Choose a shape that fits your design's intended concept. For example, if you are designing a sign with long rows of text, then opt for a long rectangular sign to accommodate your lettering. Do not attempt to squeeze it all in on a square sign. Doing so will force you to use smaller letters and will result in a lot of wasted space. 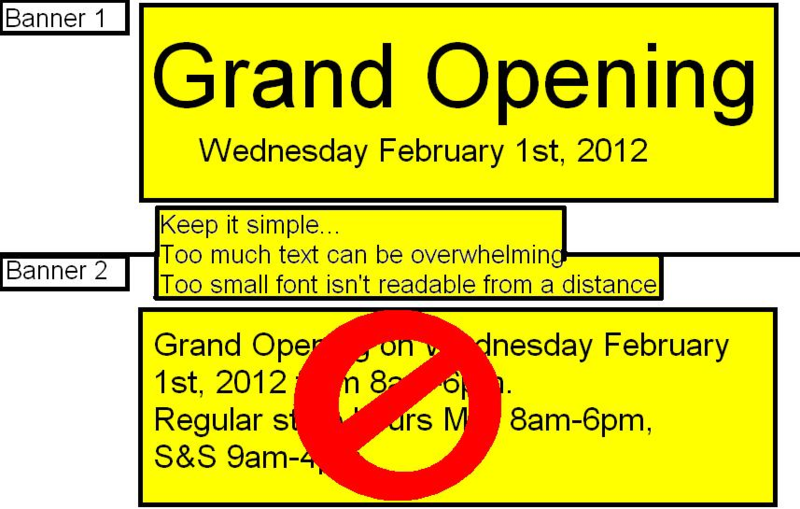 The same rule of thumb applies if your intended design requires several short rows of text, one on top of the other. In this instance, opt for a sign shaped to fit your lettering. Do not get carried away with information overload. Give your audience only the details they need and no more. The more you try to squeeze into your design, the more it detracts from the sign's effectiveness. General rule of thumb: If it needs to be said say it; if not, leave it off. Fill as much of the sign's area as possible. This doesn't mean you should get carried away and start adding text or graphics to every square inch of the design. Fill as much of the space in with your text as you can (remember, large letters can be read from a farther distance) then get creative with the remaining free space to make it as attractive and eye-appealing as possible. Graphics, colors, borders, shadows, etc., all add their own flavor to your design. Be bold and experiment with a few of these techniques to see what you come up with; you might be pleasantly surprised with the results. We have the ability to create any or all of these enhancements if you wish to incorporate them into your design. Alignment is extremely important in a design's overall visual appeal. 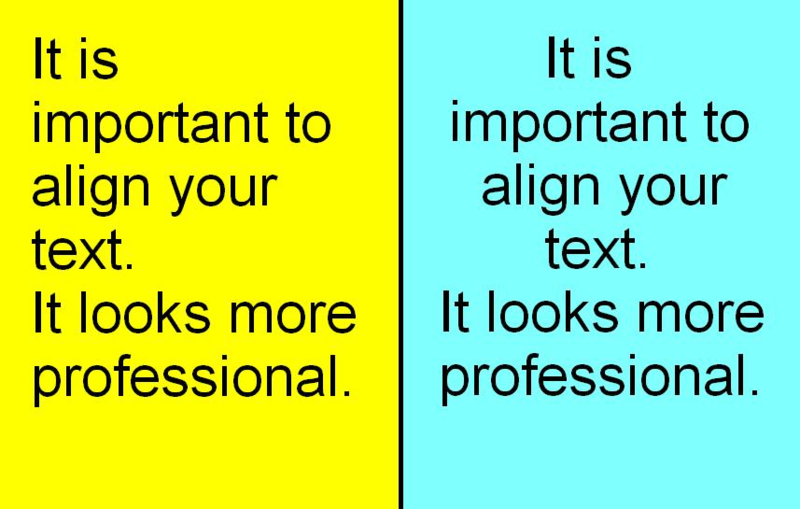 We have tools that can center-, left- or right-align all of your text for you. If the design is meant to be aligned, make sure that it is. If not, make it obvious that the design was purposely misaligned. You don't want your advertisement to appear amateurish. If your design's elements are not in proper alignment, it will show. Our final piece of do-it-yourself design advice is to examine other designs. Search for some existing designs you like for inspiration. To that end, we add new design templates to our database on a regular basis. Feel free to modify or copy them as you see fit. If, having reviewed all these design tips, you are still feeling uncomfortable about the prospect of designing your own sign, you can send your request to our customer service staff. They will be happy to work within your specifications to create a design you will be thrilled with. © 2019 Sign-A-Rama DTC 303.721.8803, All rights reserved.